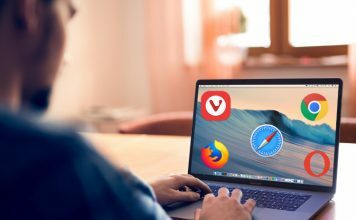 We have covered a lot of productivity tools available for Mac. However, most of them deal with the execution of an already developed idea. But, what if you are struggling to find an idea or maybe you have a ton of them and you don’t know where to start. Today, we are going to discuss a technique which will help you in either of the situations. This technique is called Mind Mapping. Very rarely we come across a tool which is leaps and bounds better than its competitors. iMindMap is a part of that rarity. Using this software is pure pleasure. It is packed with features and yet is so simple that even a child can get started. You start by creating a central idea and then create branches by just hitting enter. The branches are colour-coded and contain text input. You can attach images, videos, links, and notes. The best part is that attachments (even the videos) open in a pop-up window hence they do not require you to leave the app. My favorite feature of this app is “idea capture”. When you are in the idea capture tab, there are no distractions. You just type and hit enter to capture an idea and repeat the process until you are done. The ideas are captured in bubbles connected by a line which organizes them as sub-branches of a single branch. There is also an inbuilt tab where you can brainstorm to come up with new ideas. It looks like a board with sticky notes attached to it. 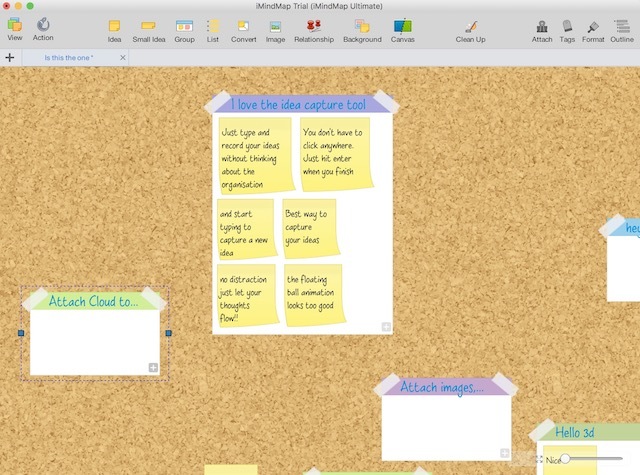 You can create sticky notes and move them between different categories. All in all, this is the best Mind mapping tool you can buy today. None of the others come even close to it when it comes to functionality and features. The only negative I could find about this software is its load time. It takes a few second to load up when you launch it, however, after it loads there is no lag what-so-ever. A premium product like this commands a premium price. But if you purchase it, you won’t regret your decision. 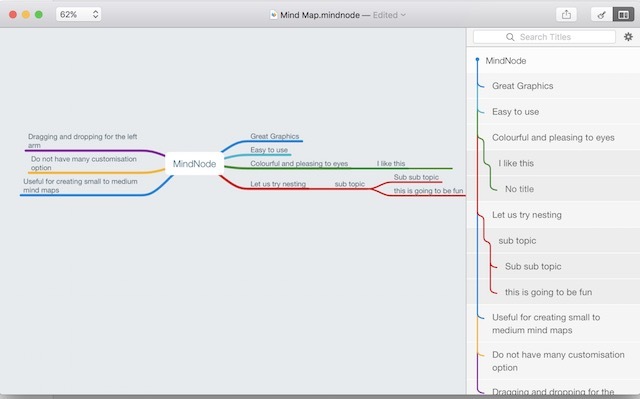 If you want a software which will not put a hole in your pocket and yet can fulfill most of your needs, MindNode is the one for you. It has a beautiful UI and works buttery smooth. 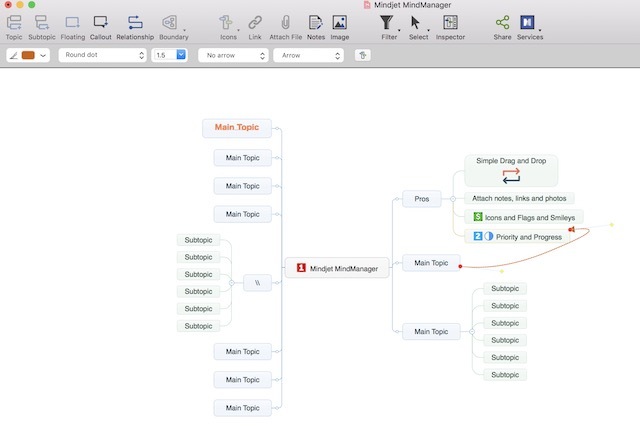 If you are just starting out, MindNode will help you learn the basics of the mind mapping technique without in your face instructions. It also has iCloud sync and an app for iPad and iPhone. Its interface is designed in such a way that you are not losing much functionality even if you are using it on mobile devices. The nodes are foldable hence allowing to create a large mind mapping tree without being overwhelmed by the data. For me, it provides the best value for money on this list. XMind got itself on this list due to its theming capability. Of course, it does everything a mind mapping software is supposed to do. 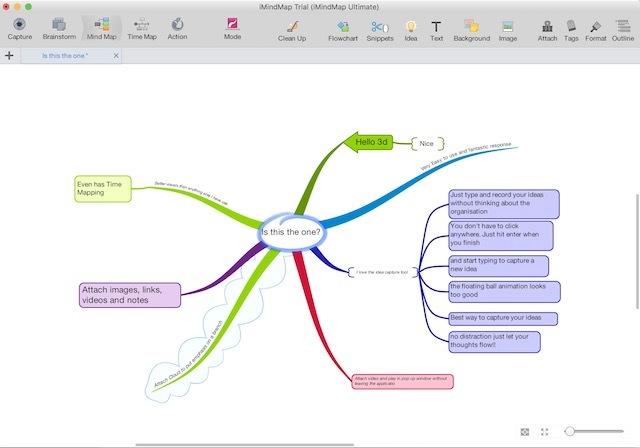 You can create mind maps, attach photos, links, and notes. You can share it or print it into PDF of OPML. 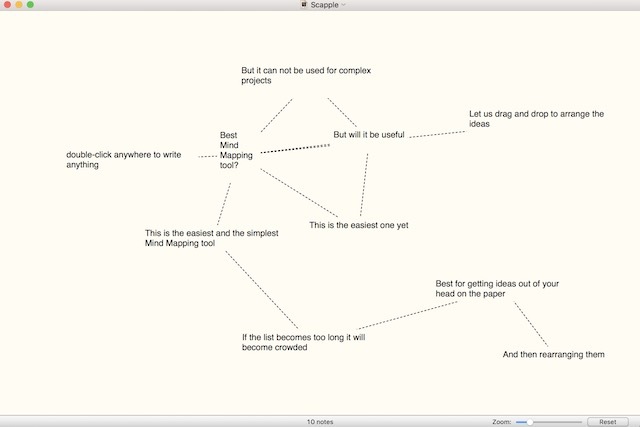 It also allows you to directly share your mind maps to your Evernote account. You can choose from pre-formatted templates or you can create you own from scratch. You can change the theme of your mind maps at any given time. There are dozens of themes to chose from and each one looks better than the other. If you like theming, give it a go. It also has a free version, however, it is fairly restricted. You are only allowed to create maps and you can neither save nor share them. You can read the full details in the link below. 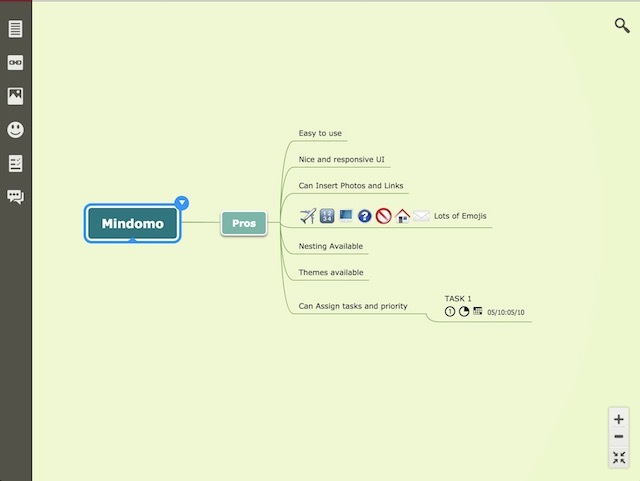 Mindomo, like other apps on this list, does everything a mind mapping software is required to do. 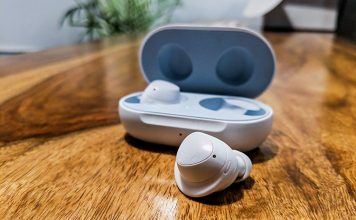 What sets it apart from others is that it allows us to attach audio notes, go into presentation mode and its cross platforms availability. It also has theming capabilities like XMind. 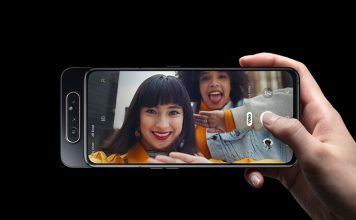 Since it is available for both Android and iOS, you can be sure that you will have your mind maps with you all the time no matter which mobile OS you use. The only thing that holds Mindomo back is its pricing strategy. It follows a subscription based payment which is always a pain. While it does offer a free version, it’s heavily limited, as it only lets you create 3 maps. SimpleMind, as it name suggests, is a very easy to use software which gets the job done. It also has a iOS client and cloud sync. It has a very colourful UI which is pleasant to look at. The app also comes with a couple of themes to customize the look and feel of your mind maps. It does not have any complex features and the sync is almost instant allowing to hand over your work between Mac and iPhone. The best part is that it also has a free version which is as powerful as the paid one. The only big missing feature is that there is no cloud support for the free version hence you cannot sync your maps across devices. 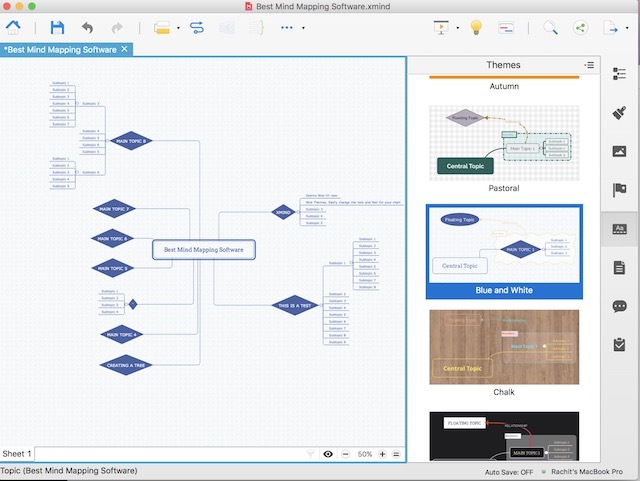 The Brain is a mind mapping software which is not suitable for the average user. 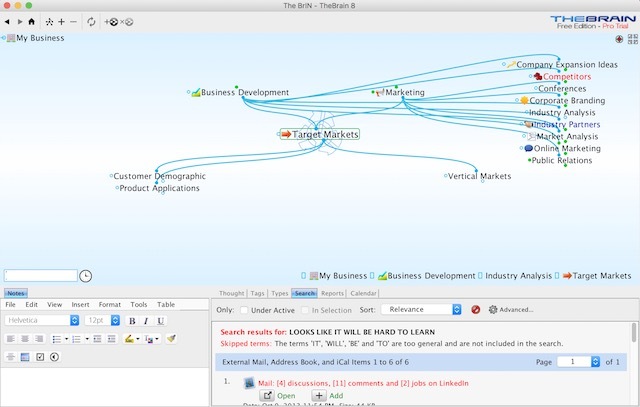 This is for someone who wants to use mind mapping for business. It has a lot of inbuilt mind mapping templates dedicated to different aspects of business such as marketing, operations and much more. The best feature of this app is its nesting ability. It is far superior to any other apps on this list when its come to nesting. Hence, you can create a large multi-layered mind map without being overwhelmed. It also has very good organisational tools. As mentioned, the app specifically targets businesses and it is also priced like one. If you need a great brainstorming, idea mapping and organisational tool for business, look nowhere else. For an average user, it is too costly and too complex to be used. This software is probably one of the first mind mapping software ever built. It has gone through a number of iterations to receive its current form. It used to be one of the best but now it has become very complex and is not suitable for an average user. Don’t get me wrong, it is excellent when it comes to features and you cannot go wrong in choosing it. However, the learning curve is too steep and the price is too high. It might be suitable for big businesses, just like TheBrain, but not for individual users. You are better off spending your money somewhere else. The only reason it is on this list is because of its legacy and to inform our readers to not to make a choice depending on its past performance. 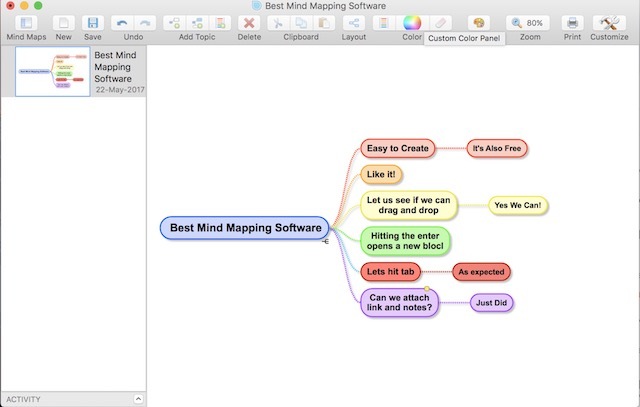 If you are looking for a completely free mind mapping software without any strings attached, look no further. 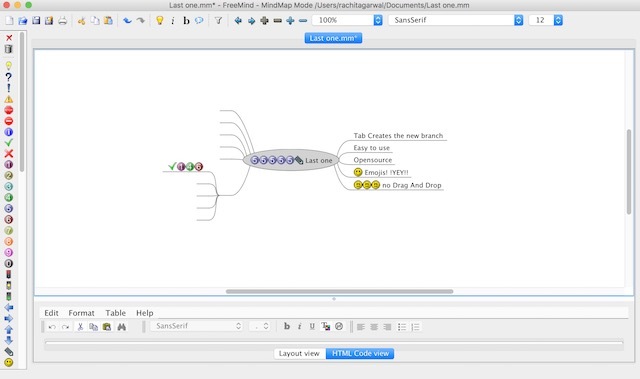 FreeMind is an open source software, which is completely free to download and use forever. 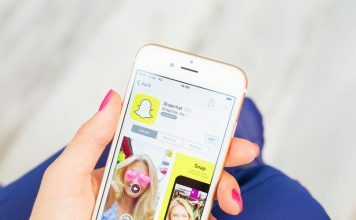 It has all the required features and goes head to head with the paid apps on this list. 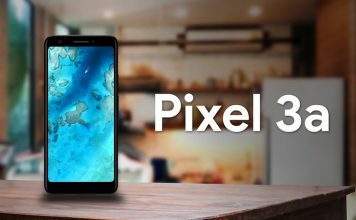 The only thing you are really sacrificing on is its UI and sync feature. The UI looks outdated, and creating a rich looking map which catches your eye is not possible. Also, it does not have any sync feature hence your maps will live only on your Mac. However, you can export the maps in PDF and share it. Considering it is a free software, it packs a punch way above its weight. Scapple provides you the closest experience of using pen and paper. It is at its heart a blank sheet of paper. You double-click anywhere to start typing and hit enter when you finish. Double-click again to start writing again and then repeat. Drag and drop one text field over another to create a link. There are no formatting tools, no colouring tools, no emojis, and no attachments. You use it as you want to. 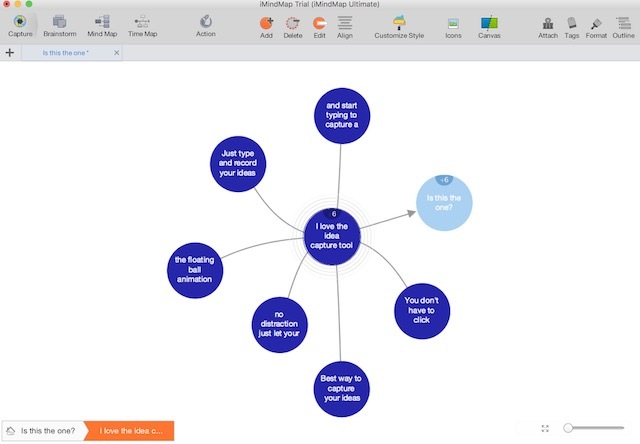 This is the best tool for creating free-form mind maps. You will use it and you will love it. Try this if you love pen and paper. At any given time our mind is flowing with ideas. The only thing we need to learn is how to capture and organise those ideas to turn them into actionable items. Mind mapping is a tool which can help you do just that. You can also use mind mapping to create an outline for your novel, plan a project, for your business and much more. Once you master it, the sky is the limit. Give it a go, and let us know when you see its benefits. Also, do tell us in the comment section below if you have a favourite mind mapping software which is not on the list.